When it comes to your wedding day look, choosing the right gown and accessories is only half the battle. The other half? "What on earth am I going to do with my hair?" It's a question made all the more significant by the pressure of wedding photos that will live on for duration of your lifetime (nbd, right?). And makeup! What about makeup? Resources such as Pinterest and Bridal Beauty Magazine are great places to gather beauty inspiration, but asking the experts helps turn inspiration into reality. 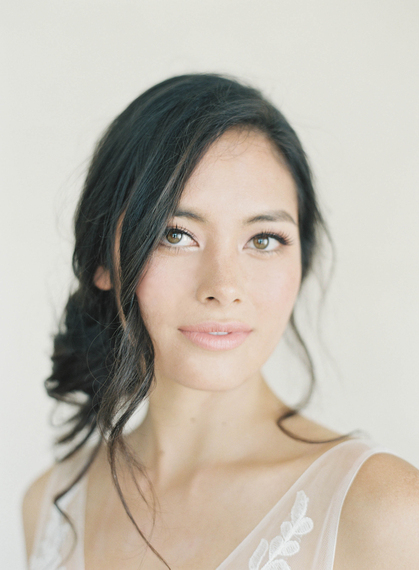 We teamed up with noted Southern California hair and makeup artist Chiali Meng and renowned wedding photographer Jen Huang to share their insight on looking like the best version of yourself for your big day. 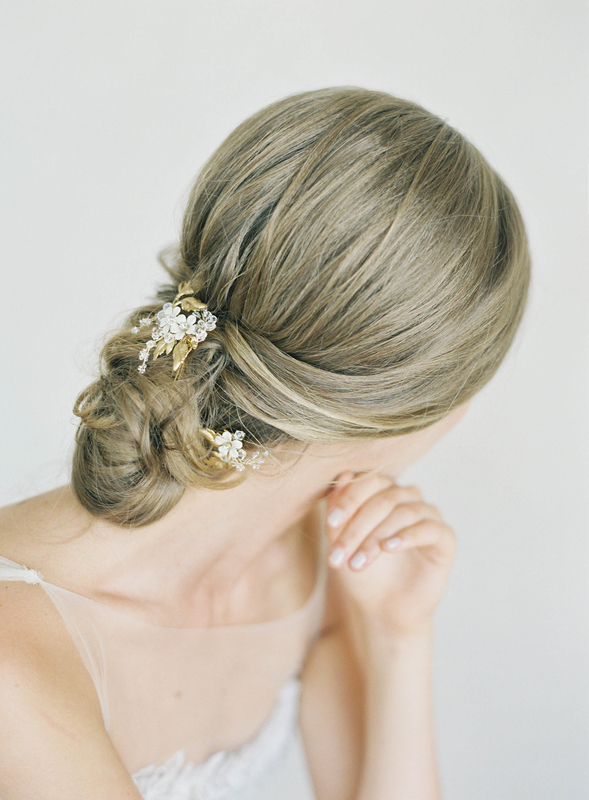 What should brides do to care for their tresses leading up to the big day? Chiali: Get a good hair cut with long, graduated layers that frame the face, especially if you're in the process of growing your hair out. Layers will help your stylist build the architecture of your look and maximize the overall effect. Also, treat yourself to a rich, multidimensional hair coloring, especially if your locks are dark. The lighter tones will showcase the intricacy of your hairstyle and look better in photographs. How should brides to go about picking the perfect wedding hair accessory? Chiali: Find something that reflects your unique personality and style, but keep your dress design in mind, along with the proportion of your hairstyle, and how your hair accessory will stand out. Your headpiece should complement your look, but not overwhelm or dominate. Jen: My personal favorite hair accessories are the timeless ones - as with photography, you don't want to embrace every trend that comes along, rather stick to simple designs that will remain classic years down the line. The Laurette Combs (pictured above) are a great example of this. Hair and makeup trial appointments -- are they necessary? Chiali: Absolutely necessary! I can't emphasize how important having a trial is. This is the time when you can consult, play around with different ideas and looks, and get on the same page with your stylist. You want to feel confident and look your absolute best on your wedding day. There's no time the day-of to play the guessing game! Jen: It's important to choose the hairstyle or makeup look that makes you feel beautiful and comfortable. That might not always end up being what you originally planned, so a trial is a great idea. Updos are great for those who know their hair may fall flat if it is loose and down. But a casual curl is one of the most loved styles I see with my brides because they feel like themselves and not overdone. It's important to choose a look that fits with your overall wedding style and a trial will help you figure out what that is! When it comes to wedding makeup, what's the one thing you wish brides knew ahead of time? Chiali: To be very upfront about your likes and dislikes and give your makeup artist guidelines on the direction of the look that you want to achieve. Visual cues are very helpful in helping us nail your vision! Jen: As in all relationships, communication and trust is key, and an open, respectful line of dialogue is very helpful in achieving a bride's desired look. I always advise my clients to choose a makeup artist who makes them feel so comfortable they don't even have to look in the mirror to check the final outcome -- like they could step out of the room and feel confident and beautiful the entire day. What are some of the hair and makeup products every bride needs? Do you have any tried and true go-tos? Chiali: The Hard Formula eyebrow pencil by Shu Uemura has been in my makeup kit for twenty-something years. It is an absolute must-have and creates the most natural looking brows. I have every single color that I mix and match for my brides. I also have to make sure they remain flawless through all kinds of weather and emotions, so I turn to MAC Liquidlast Liner. No raccoon eyes here! Two of my other favorite products are the Shiseideo Eyelash Curler for the long-lasting, perfect curvature it creates that really open up a bride's eyes, and NARS Luster Blush for its versatility and ability to flatter all skin tones! What are the biggest hair trends you foresee in 2017? Chiali: I'm loving the effortless and touchable, textured hairstyle that's trending right now. It's romantic and fashion-forward and such a nice departure from the tight, princess barrel curl that was so popular in weddings for a long time. We will also see lots of twists and knots, with the braid trend remaining strong well into 2017. Jen: While trends may come and go, remember that makeup and hair are only one part of a larger day, a day whose purpose is to celebrate love and put your best foot forward on the start of this brand new chapter of your life. Choose a look that speaks to who you are, who you want to become, and what type of couple you wish to remain.